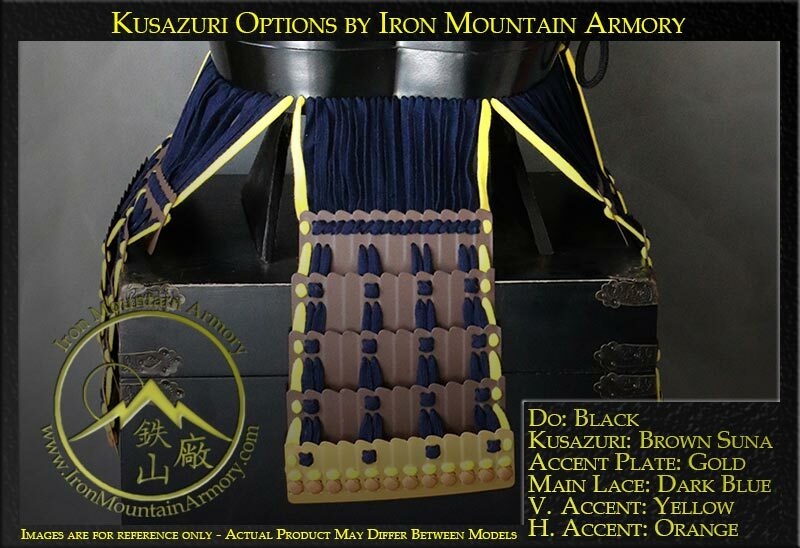 Here we provide detailed explanations for the order options clients can have when customizing their samurai armor, clothing and accessories from Iron Mountain Armory. We try to make ordering fun and easy for everyone. With so many different options and special terms it can get confusing. We’ve created this page to answer any questions you might have about these options. Click the text link for a visual example of the option. If you have any questions please review our FAQ Page or feel free to Contact Us directly. We are always happy to help you. 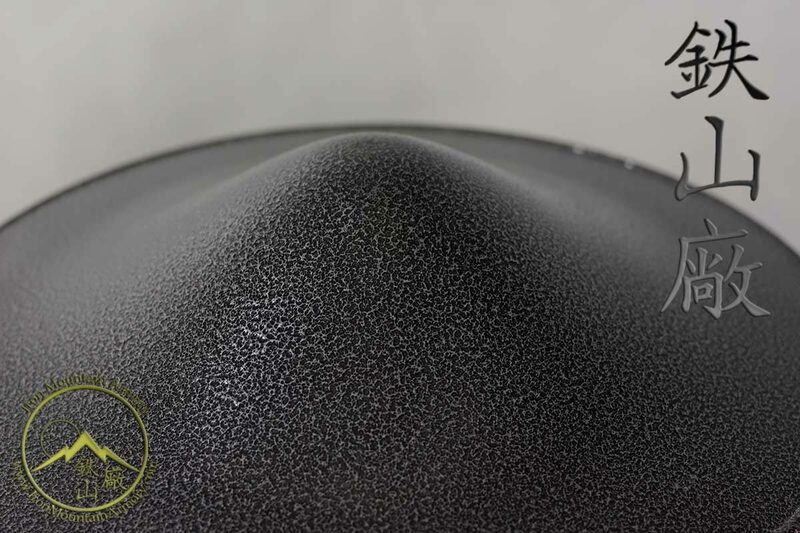 ZUNARI (Kachi & Gashira): A robust 5 plate design bowl style kabuto which matches the natural contour of a person’s head. 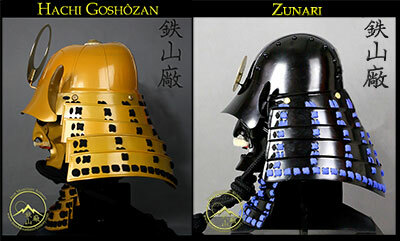 MOMONARI (Gashira Only): A “peach shaped” helmet inspired by European styles and believed to be a bullet-proof design. 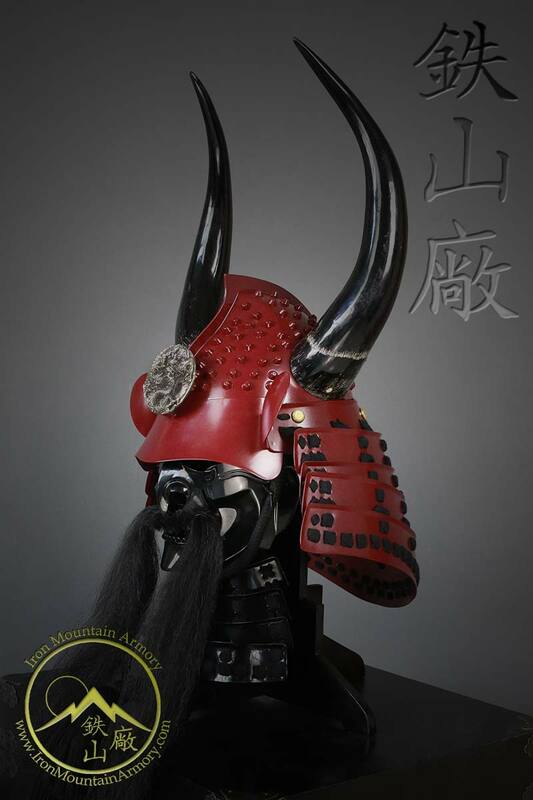 SUJI-BACHI (Gashira Only): A bowl shaped helmet designed with individual plates overlapping each other. – Simulated designates a simple bowl helmet with simulated overlapping plates. 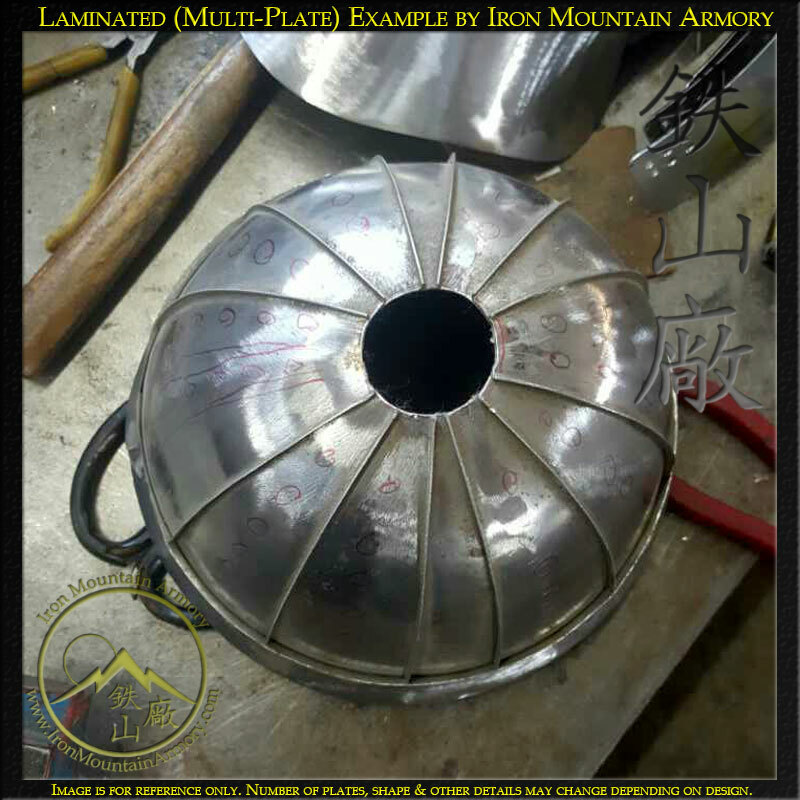 NUMBER OF PLATES: This option is available for “suji-bachi” style helmets and allows you to chose how many plates are used to craft the “bowl” section of your helmet. 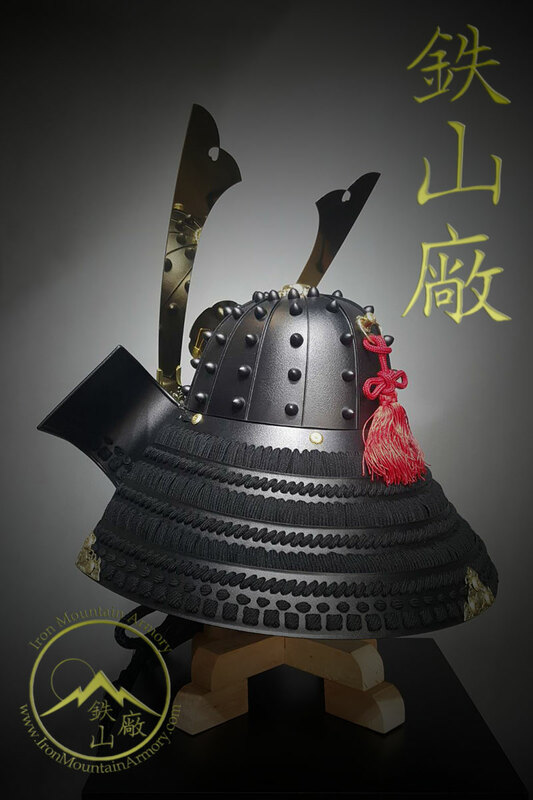 The standard for Kachi and Gashira class armor is “Simulated” which means the helmet bowl will be crafted from a single sheet of steel and made to look like it is crafted from several pieces, unless you specify to have a certain number of plates (not available on all models). 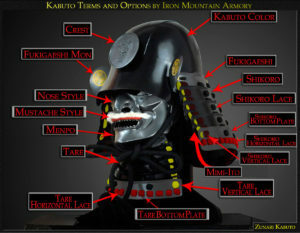 KABUTO COLOR: This option changes which color and texture the entire helmet is painted. 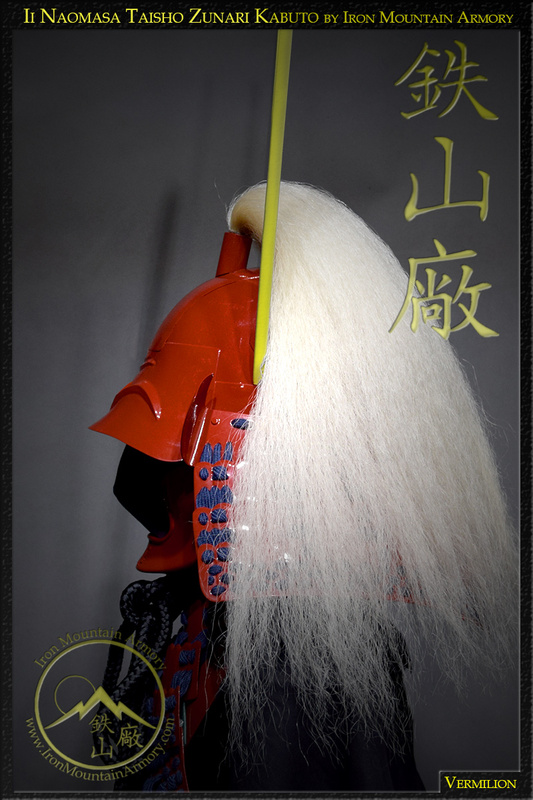 SHIKORO COLOR: Select the main color & finish for your “neck guard” to be painted. You can paint the bottom plate a different color by using the “Advanced Custom Options” below. MAIN LACE COLOR: Select the main lace (odoshi) color you would like for your neck and throat guard to be painted. You can customize your lace patterns by using the “Advanced Custom Options” below. 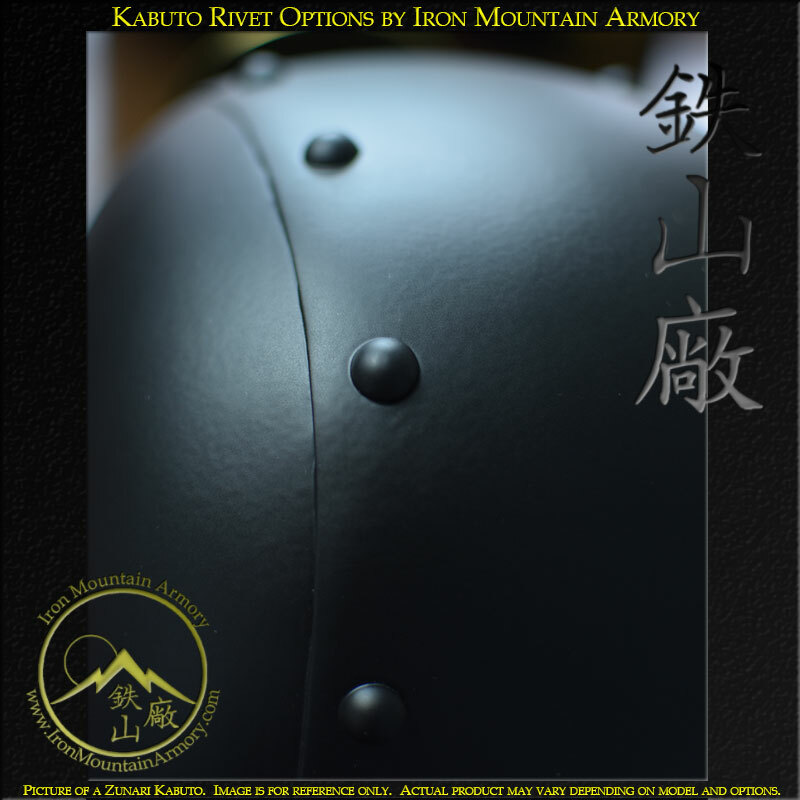 KABUTO RIVET OPTION: Select this if you would like your helmet to be smooth or have raised rivets. Hachi Goshozan – This will add a row of rivets down each plate section. Zunari – This will add rivets along the 2 center seams. 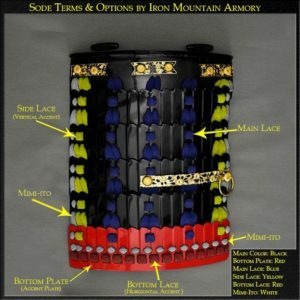 Momonari – This will add several rows of rivets, from front to back. Suji-Bachi – This will add a row of rivets down each plate. Hari-Bachi – This is a standard feature for this kabuto and features a row of rivets down each plate. 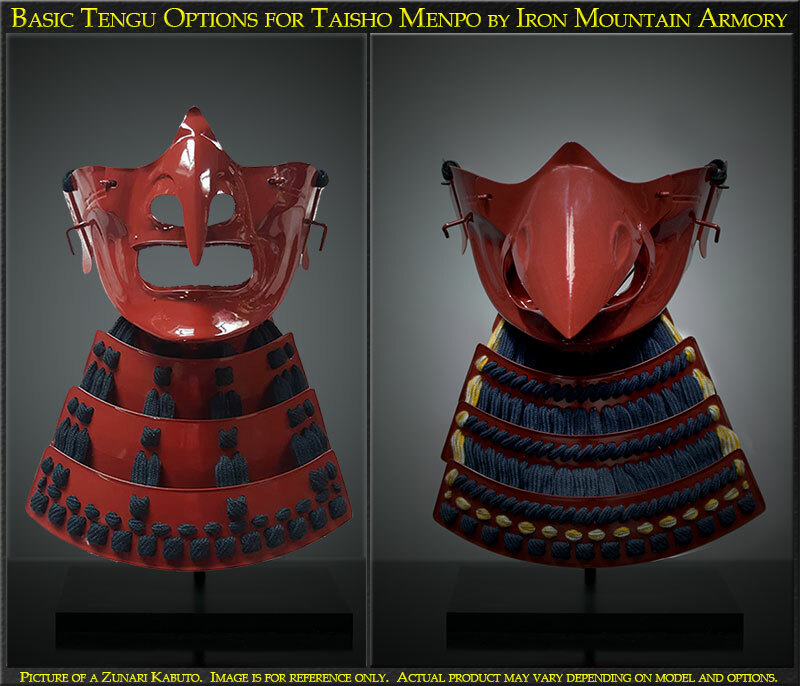 MENPO STYLE: This gives you the choice to select the style of face armor that will be crafted with your helmet. Depending on which mask you select will give you more or less customization options. MENPO COLOR: Select the main color and finish with which your mask and throat guard will be painted. You can paint the bottom plate a different color by using the “Advanced Custom Options” below. 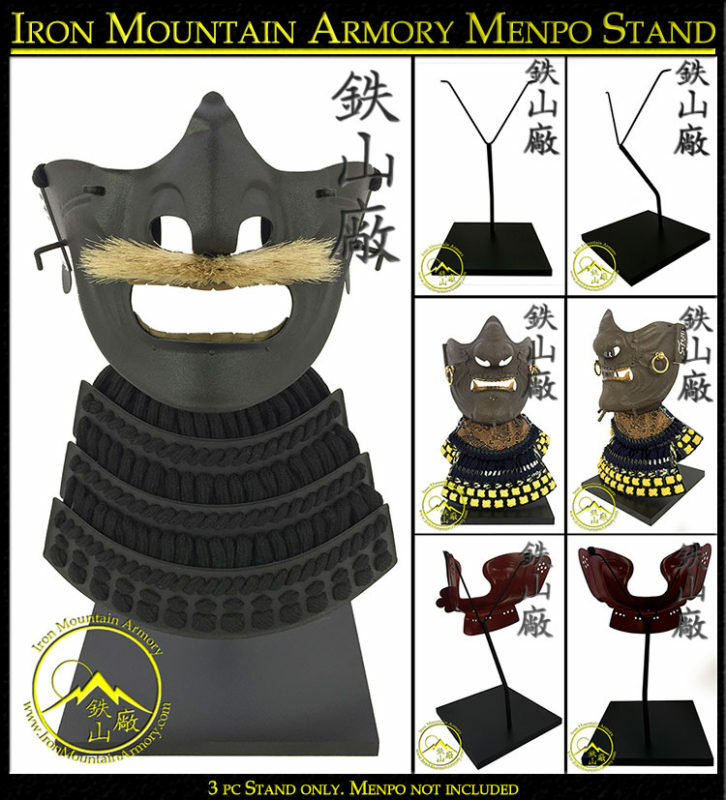 MUSTACHE STYLE: Add character to your armor by selecting a custom mustache option. This option is only available on certain mask or nose styles. NOSE STYLE: This option is available when “Menpo” is selected, and is often the standard option for all helmets. You can choose between the different noses available for the style of mask you selected. 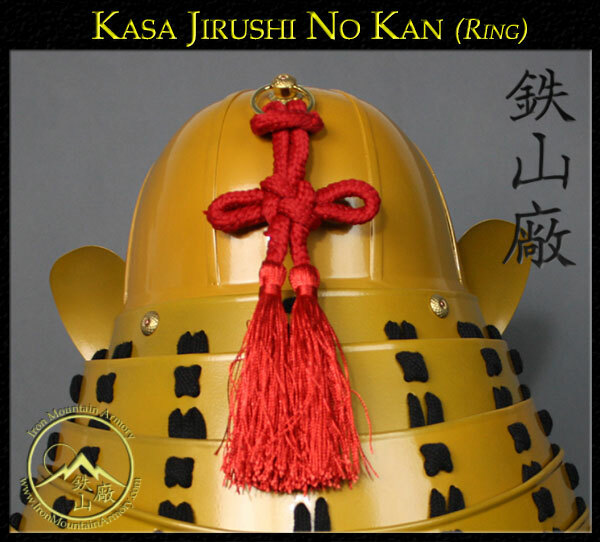 KABUTO OPTIONS – Ring with Tassel: This is the “Kasa jirushi no kan” which was a ring on the back of a helmet, designed to carry a small identification flag or, on later helmets, an agemaki bow (a specially knotted cord). This is not available for all helmet models. DISPLAY TYPE: A standard portable stand is included with every helmet order. This option allows you to upgrade to a fully adjustable portable display stand or add a wooden storage / display box to your order. 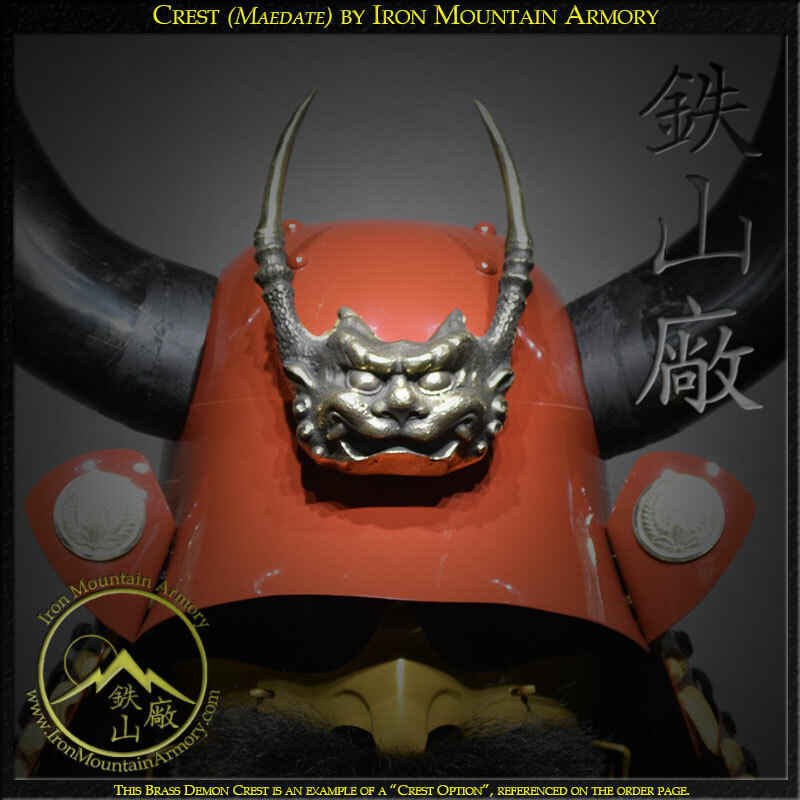 KABUTO COLOR: Select the main color & finish your helmet will be painted. You can paint individual helmet parts using the “Advanced Custom Options” below. FUKIGAESHI COLOR: Select the color & finish the ears, or fukigaeshi, will be painted. 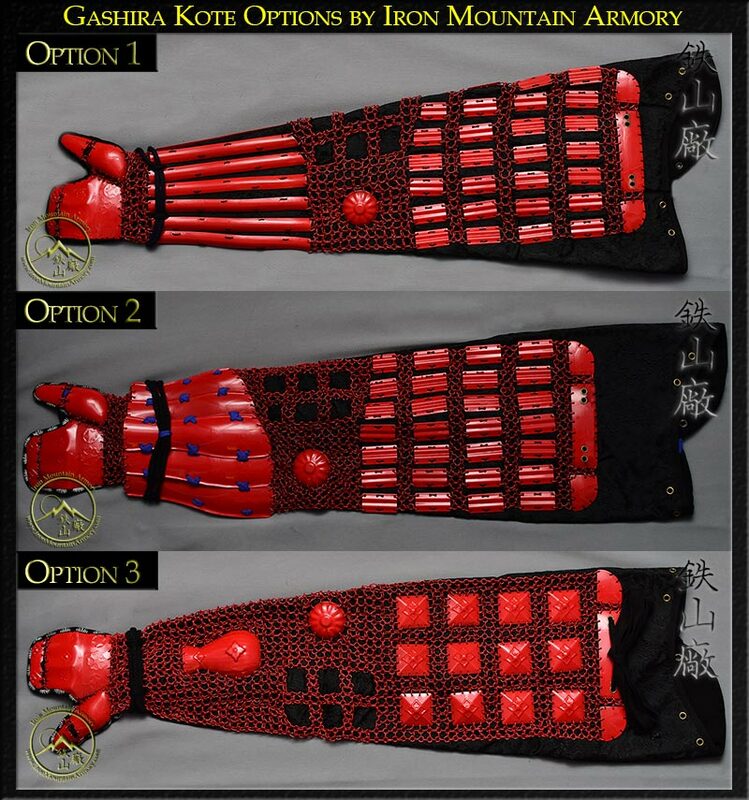 SHIKORO HORIZONTAL LACE: This option changes the color of lace, or odoshi, which is used on the lower lace that runs along the bottom plate of the neck guard. This is different from the mimi-ito. SHIKORO VERTICAL LACE: This option changes the color lace (odoshi) is used along the outer edge of the neck guard. This is different from the mimi-ito. 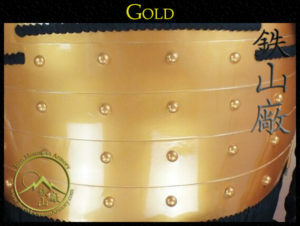 SHIKORO MAIN LACE: This option changes the color lace, or odoshi, which is used along the outer edge of the neck guard. This is different from the mimi-ito. 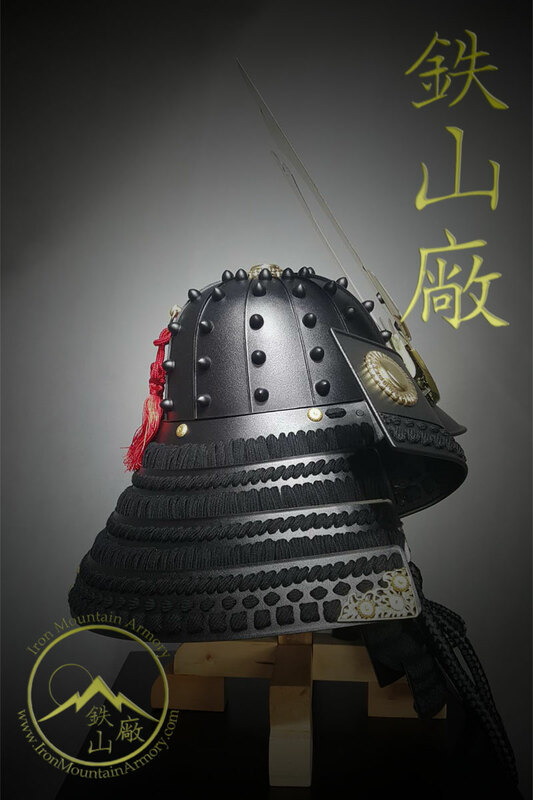 SHIKORO MIMI-ITO LACE: This option changes the color of lace, or odoshi, which is used on the neck guard of the helmet and will replace the “MAIN LACE COLOR” option. TARE COLOR: This option changes the color and texture of the neck plating when the mask section is painted. TARE LACE COLOR: This option changes the color of lace, or odoshi, which is used on the throat guard of the mask. It will replace the “MAIN LACE COLOR” option. 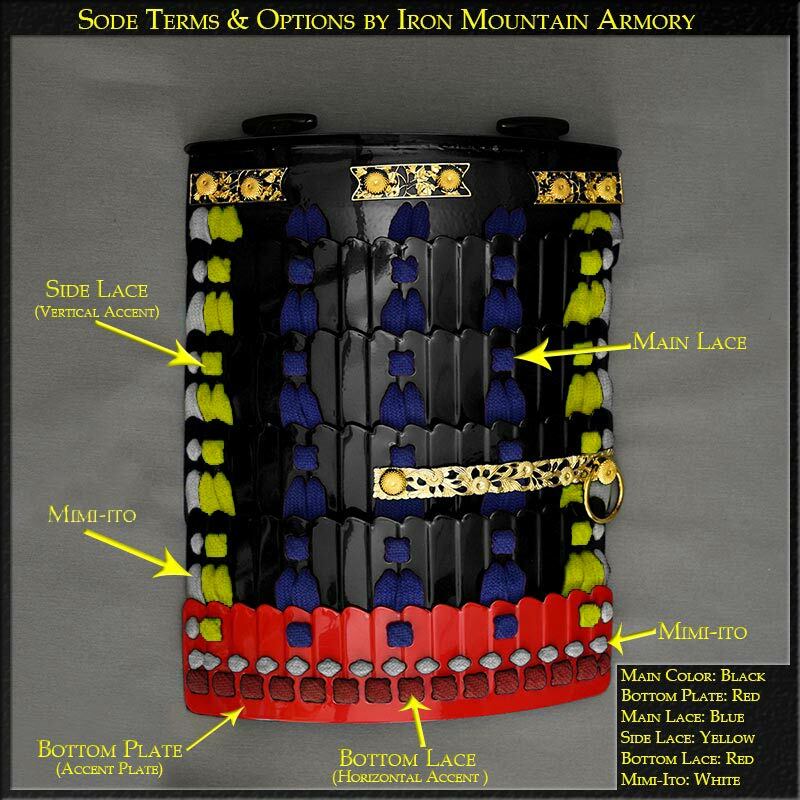 TARE HORIZONTAL LACE: This option changes the color of lace, or odoshi, which is used on the lower lace that runs along the bottom plate of the throat guard. This is different from the mimi-ito. TARE VERTICAL LACE: This option changes the color of lace, or odoshi, which is used along the outer edge of the throat guard. This is different from the mimi-ito. TARE MIMI-ITO LACE: Add an extra row of lacing to your tare (throat guard) for an additional cost. If it is left blank it may match your MAIN LACE option selected above. 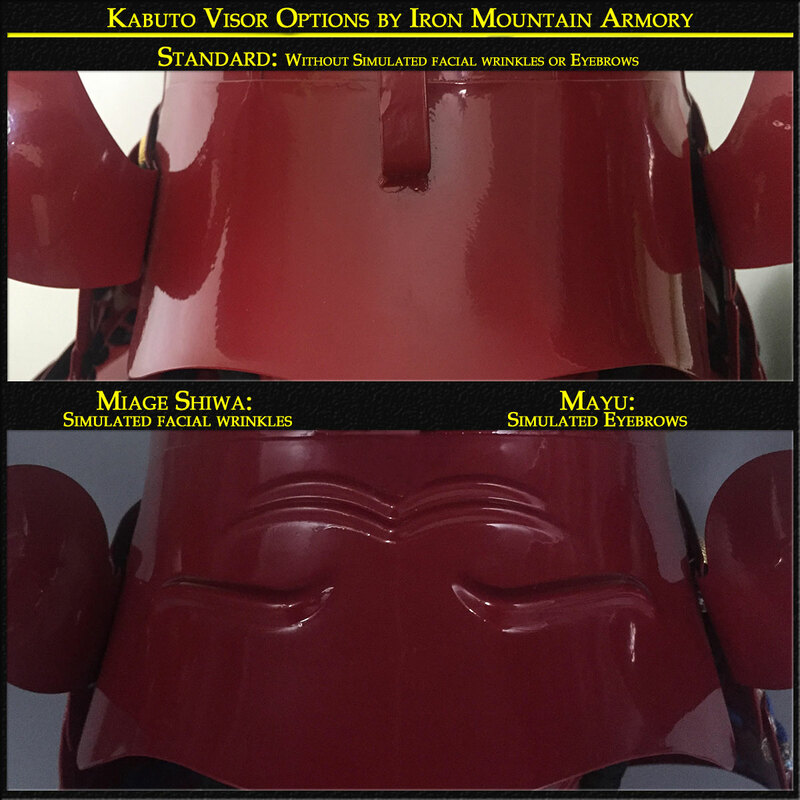 KABUTO VISOR OPTIONS: Customize the visor of your helmet with embossed eyebrows and/or wrinkles. 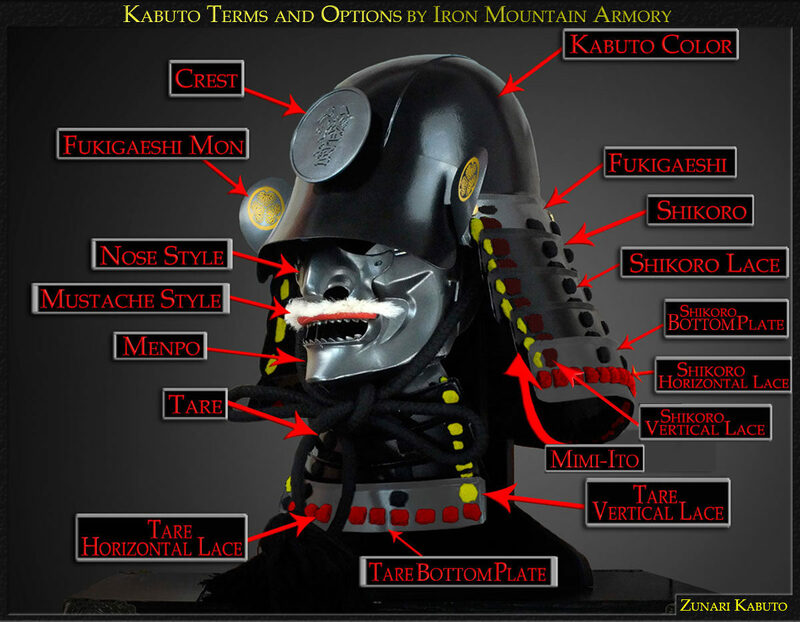 KABUTO TRIM OPTIONS: Select this option to add a fukurin (metal trim) around the outer edges of your helmet. This option might differ depending on model and/or different options selected. 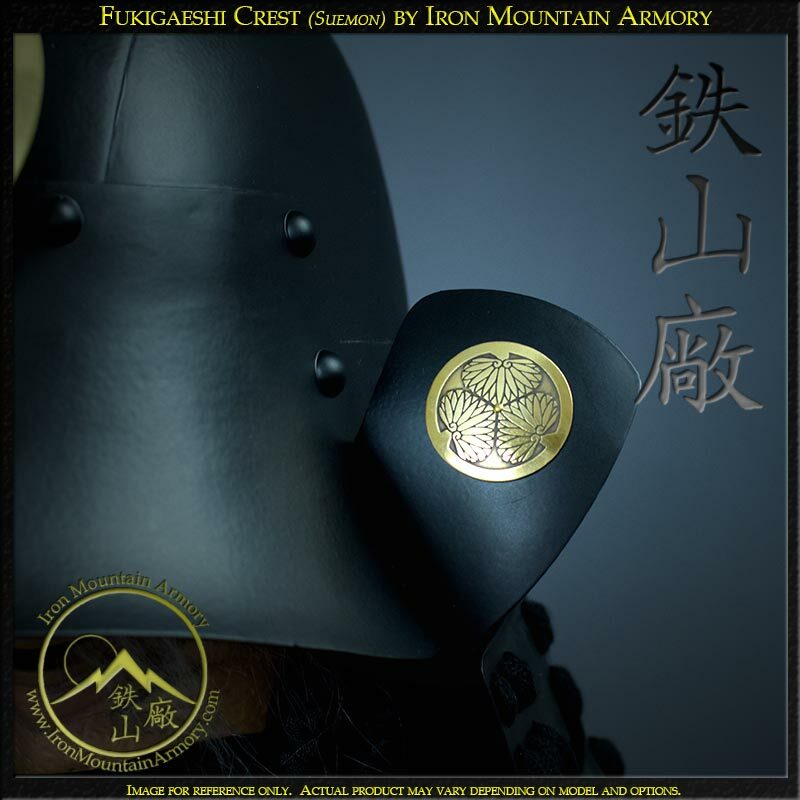 FUKIGAESHI CREST: Add a mon (symbol) to the fukigaeshi (ears) of your helmet. This can be a standard mon or custom design which you can email us in “Clip-Art” format. Also known as a Suemon. ADD PONY TAIL: Add a horse or yak ponytail to the top of your helmet. This option might differ depending on the model and/or different options which you have selected. MENPO COLOR: This lets us know what color you would like your face mask painted. 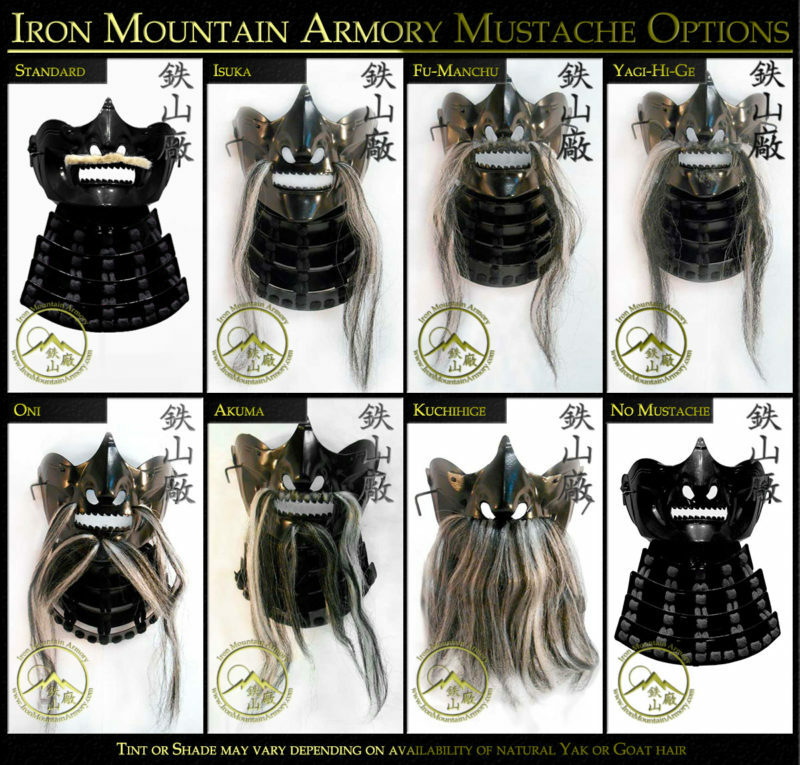 MUSTACHES:Add character to your armor by selecting a custom mustache option. Note: This option may not be available depending on which “nose” option you select. 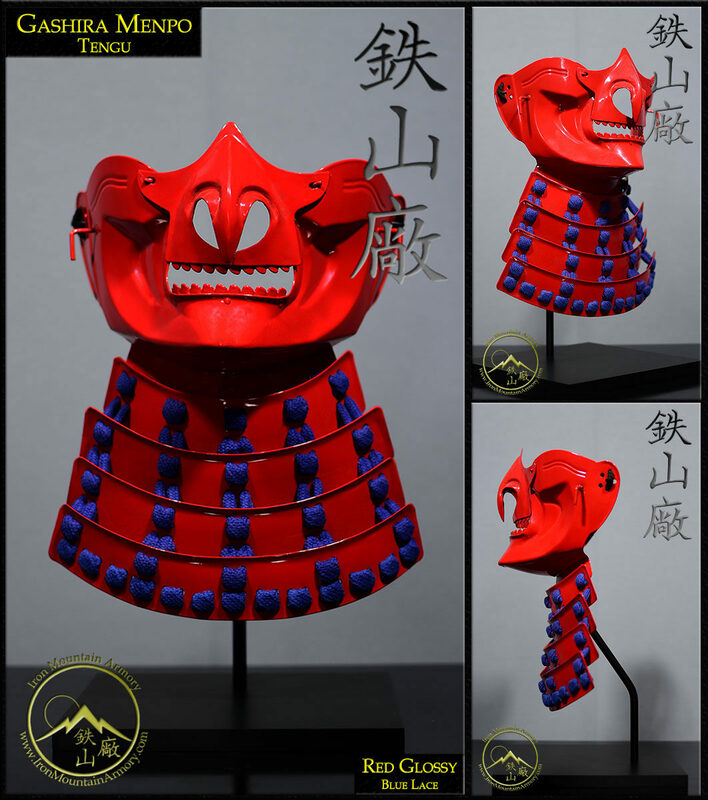 TARE LACE COLOR: This option changes the color of odoshi (lace) which is used on the throat guard of the mask. 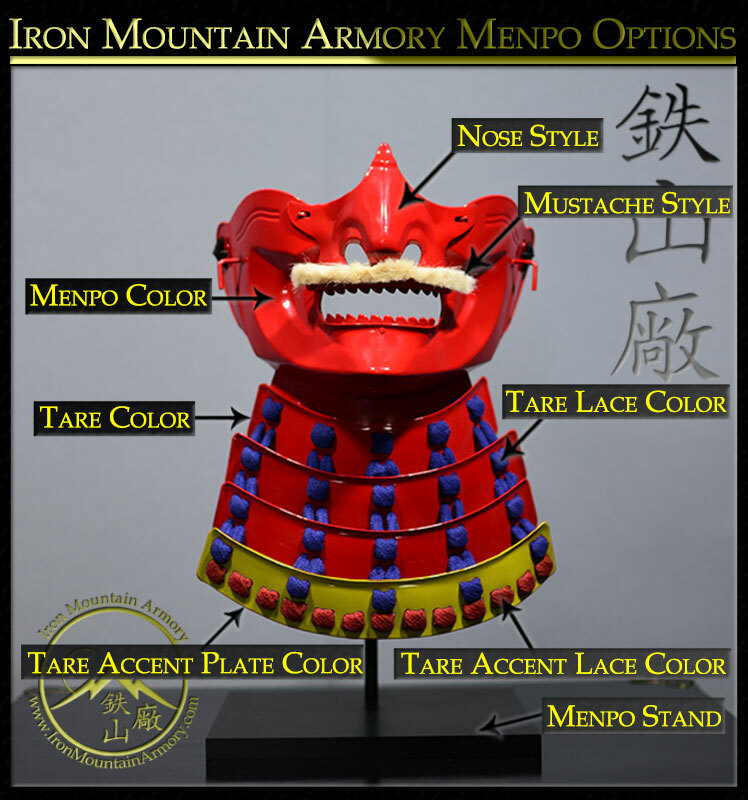 TARE PLATE STYLE: This changes the plate style for the throat guard which will be used on your mask. DISPLAY TYPE: This adds a custom table top display stand to your order. This is a great way to display any mask. TARE COLOR: This option changes the color and texture of the neck plating on the mask section when it is painted. 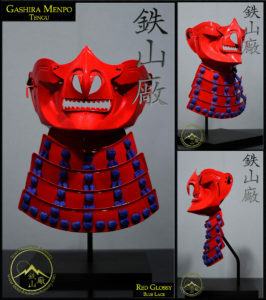 TARE ACCENT PLATE: This option changes the color and texture of the lowest hanging plate of the mask neck protector when it is painted, also known as “Suso no ita“. 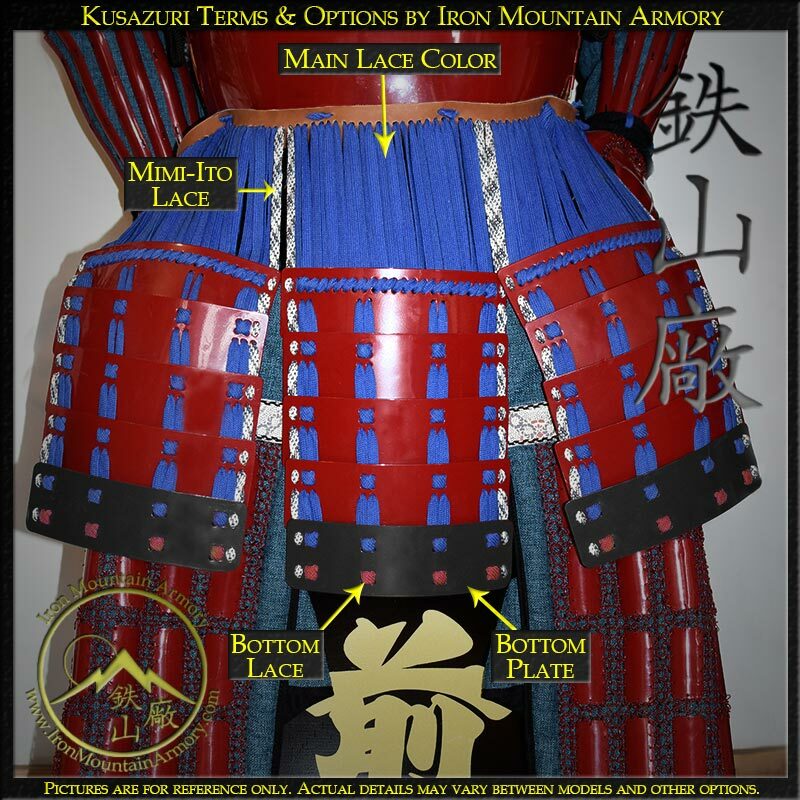 TARE HORIZONTAL LACE: This option changes the color of odoshi (lace) when it is used on the lower lace that runs along the bottom plate of the throat guard. If you add a Mimi-Ito, the Mimi-Ito lace will be added above the horizontal lace. It sits above the horizontal lace. 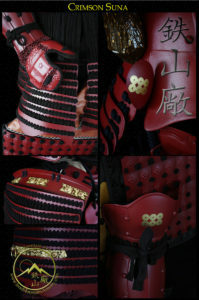 TARE VERTICAL LACE: This option changes the color of odoshi (lace) which is used along the outer edge of the throat guard. This is different from the mimi-ito. This option changes or adds the odoshi (lace) to be used along the outer edge (vertical & horizontal) of the throat guard. If you select vertical lace, this will add another outer lace, making your vertical and horizontal lace second. 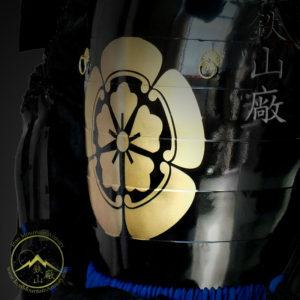 MAIN ARMOR COLOR – This option changes the color and texture with which the chest and back section of your dō is painted. MAIN LACE COLOR – This option changes what color lace , or odoshi, is used on your dō. 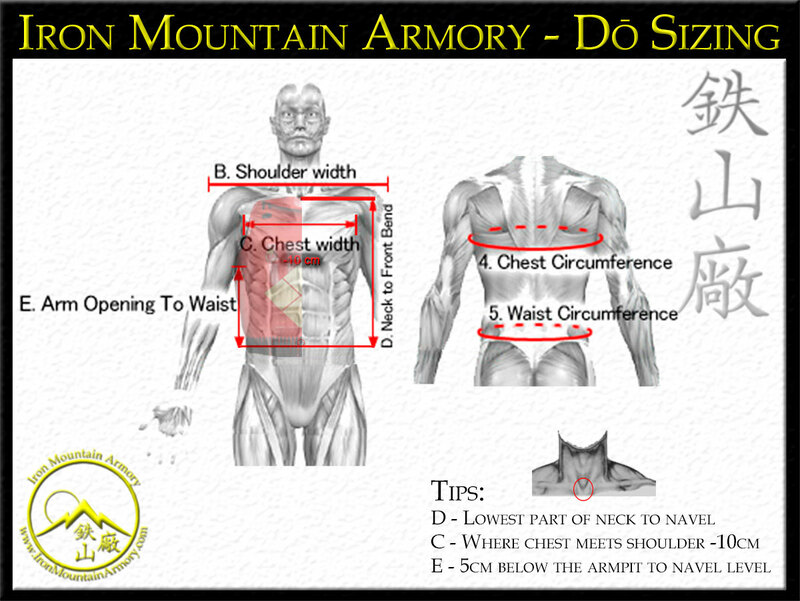 CHEST SIZE – This option changes the girth size of your dō. While inhaling deeply, have an assistant wrap the tape measure under your armpits and around the largest part of your chest. In the back, you will want the tape measure to wrap across your shoulder blades. The tape measure should be snug, but not tight. NECK TO FRONT BEND – This option affects the distance between the very top of the dō to the very bottom of your dō plate. The dō should rest where you waist and hips meet. This length adjustment will help stop your dō from pressing into your chin when sitting. Measure it from where your throat meets your chest, and straight down to your navel. Do not measure the contour of your chest and belly, this should be measured with a measuring stick. ARMPIT TO WAIST – This option affects the distance between the armpit and waist of your dō. 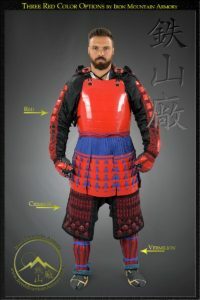 This prevents the armor from pushing into your armpit while training or sitting. Starting 8 cm below your armpit, measure straight down to your navel line. Do not measure the contour of your chest and belly, this should be measured with a measuring stick. KUSAZURI PLATE COLOR – This option changes the paint color and texture of the hanging plates below the dō. KUSAZURI BOTTOM PLATE – This option changes the paint color and texture of the very bottom hanging plate, below the dō. 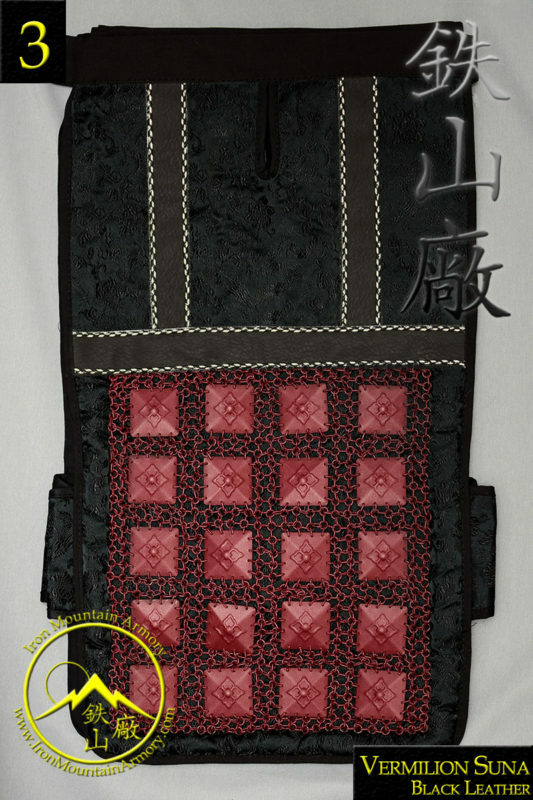 KUSAZURI LACE COLOR – This option changes the color of lace which is used for the hanging plates below the dō. 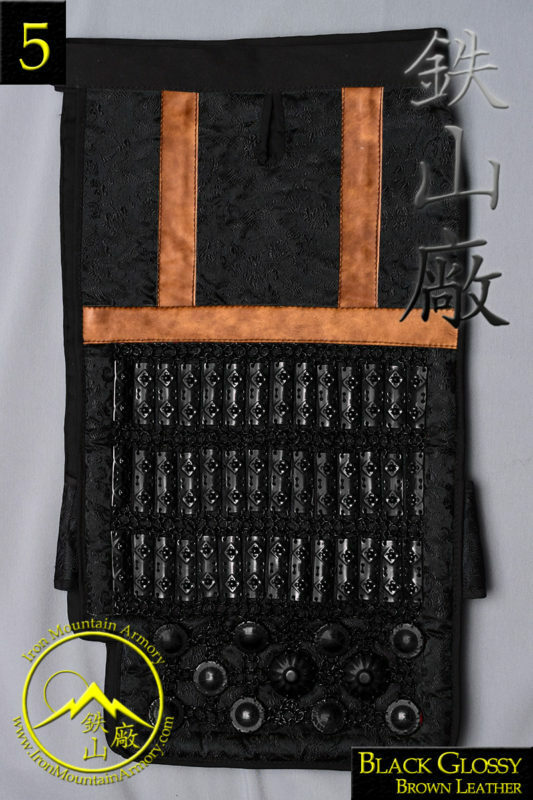 KUSAZURI BOTTOM LACE – This option changes the color of lace which is used for the horizontal lacing at the very bottom hanging plate, below the dō. This is different from the mimi-ito. KUSAZURI SIDE LACE – This option changes the color of lace which is used for the vertical laces, going down the outside of the hanging plates, below the dō. This is different from the mimi-ito. MIMI-ITO COLOR – This option changes or adds a color or even multi-colored lace (depending on model and option selected), to the bottom and side laces of the kusazuri. This will be added in addition to the “side” or “bottom” lace, if either option is selected. AKA “horizontal” and “vertical” lace. SHOULDER PAD FABRIC – This option changes the fabric used in the shoulder padding of your dō. If left blank the standard fabric will be used which matches your color options. 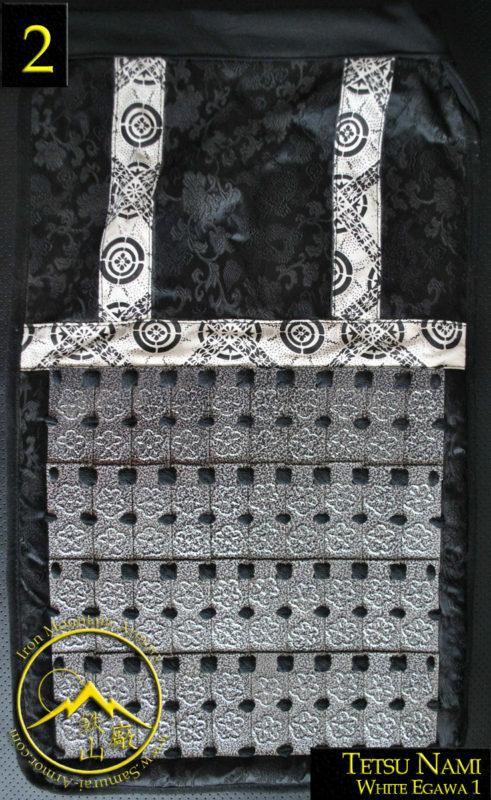 SHOULDER PAD LACE – This option changes the wide lace used in the shoulder padding of your dō. 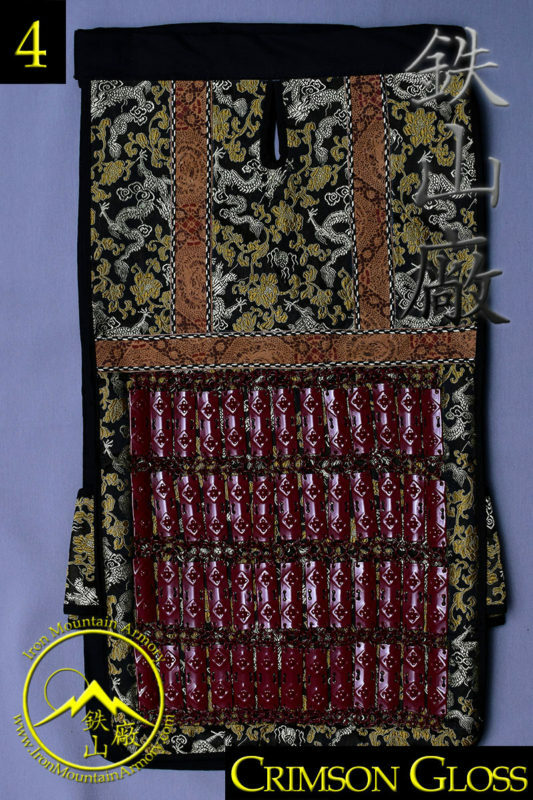 This lace holds the kikko (armor plates) of the shoulder padding in place. Dō RIVET STYLE – This option changes your dō details by keeping a smooth finish or adding raised rivets. ADD BRASS FITTINGS – This option changes the decor of your dō by adding or removing the brass fittings used to decorate it. 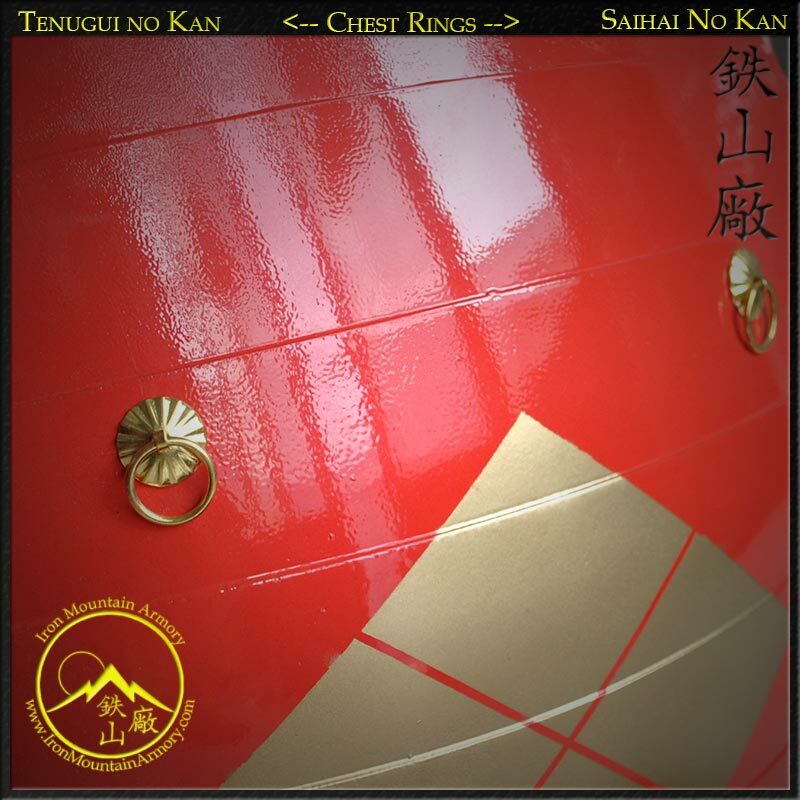 Dō CHEST RINGS – This option changes the detail of your dō by adding 1 or 2 rings to the chest section, it can be used to display tassels or hold a saihai or gunbai. 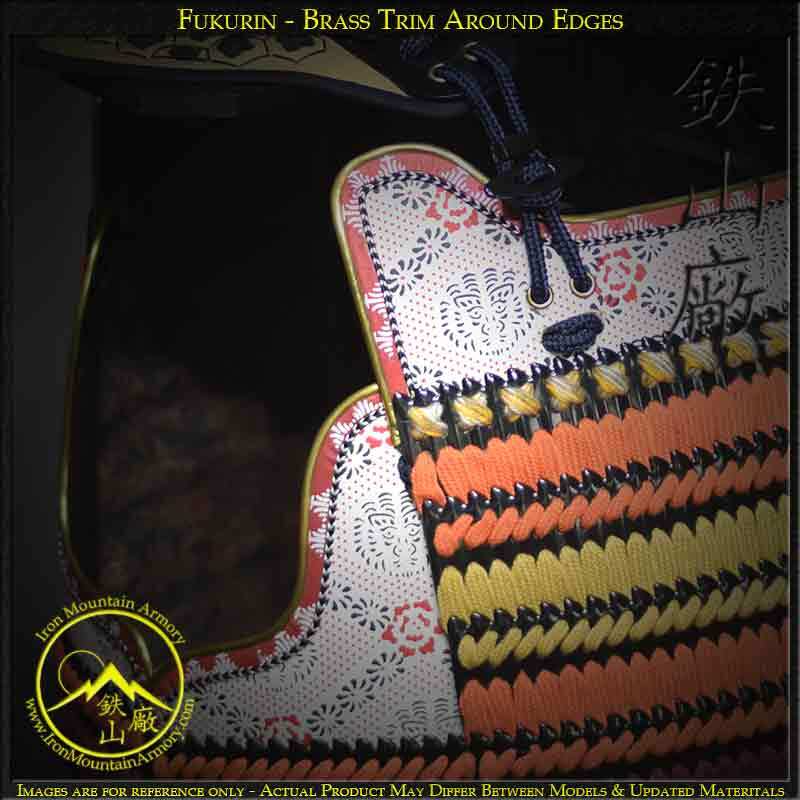 Dō TRIM OPTIONS – This option is for adding a “Fukurin” or a decorative metal trim over the edges of your dō. Dō HOLDING RINGS – This option adds 1 or 2 rings to either side of your dō, used to hold bags, tie a weapon, gunbai and/or your sarashi in place. Running your sarashi through the rings, will help hold your dōfirmly in place. 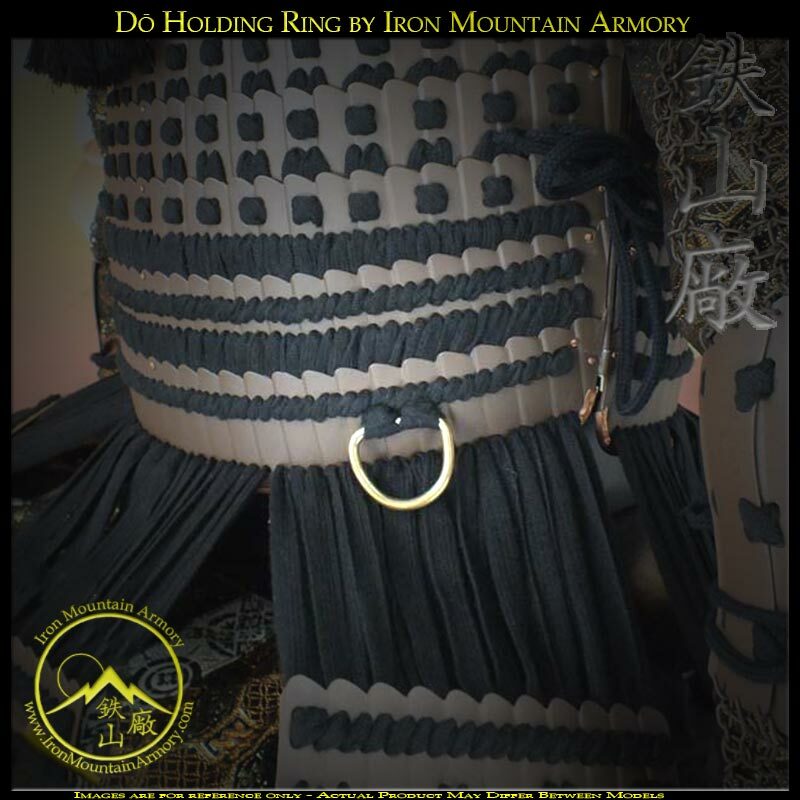 We recommend adding both rings if you plan to wear your armor, especially if you are training. 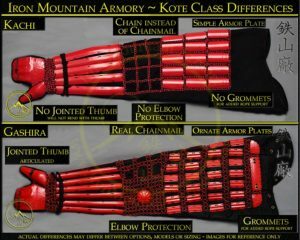 Dō BELT OPTIONS – This gives you the option to add an obi or sarashi to your dō. Obi is used under the dō to provide comfort when wearing. 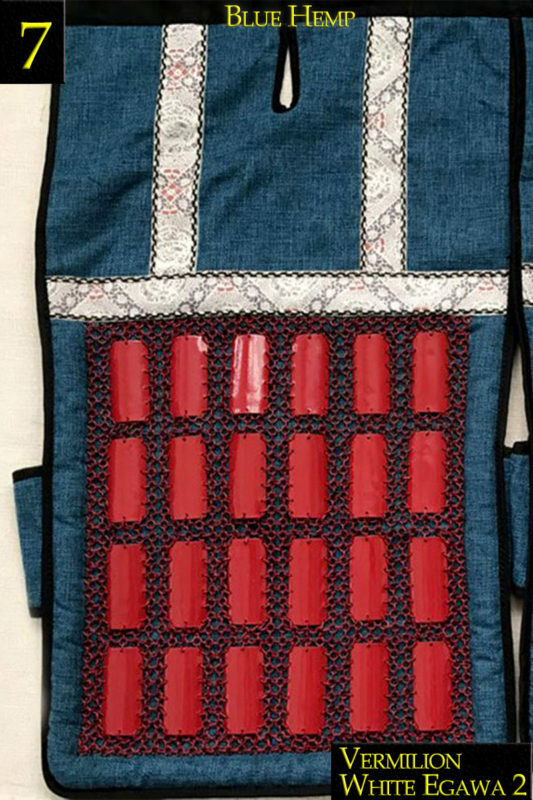 A sarashi is worn over the top to secure the dō in place as well as hold items, like a tanto and katana. ADD BANNER HOLDER – This option adds the parts needed to attach a sashimono, or war banner, to the back of your dō. KUSAZURI OPTIONS – This option offers to make your kuzazuri detachable or interchangeable. 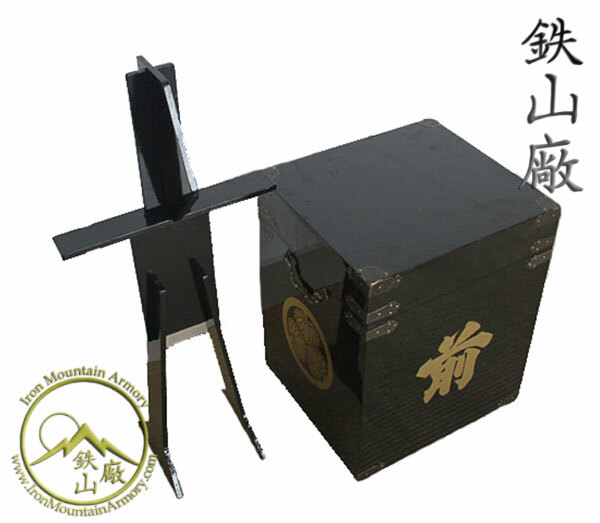 Commonly used in the past for fast repair or replacement of the kusazari or removable to create fast and quiet movement of troops. 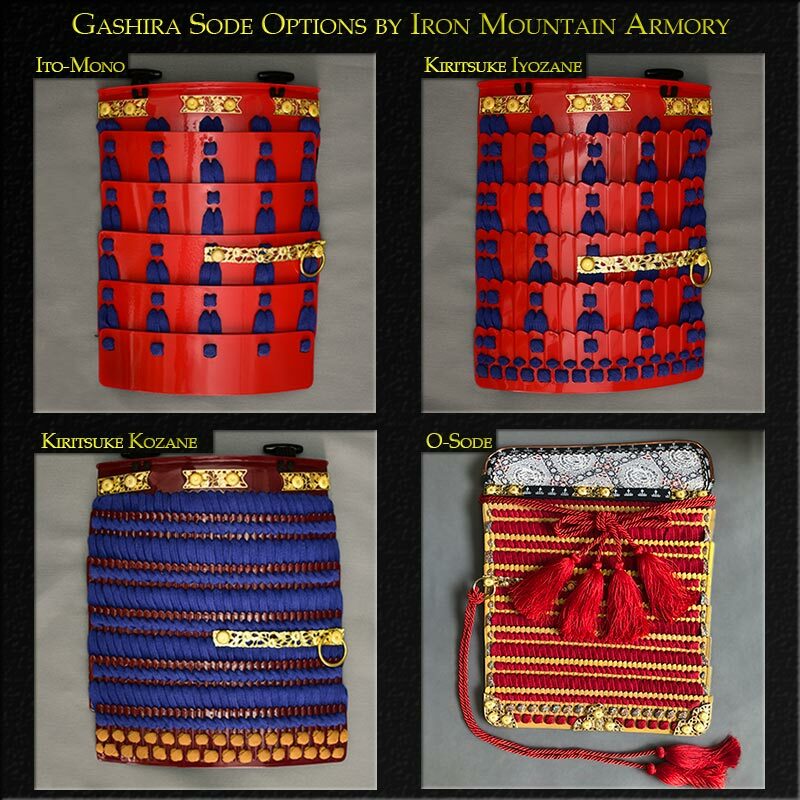 ADD YOROI BITSU (BOX) – This option offers to make your kuzazuri (skirt plate) detachable / interchangeable. Commonly used in the past for fast repair / replacement of the kuzazuri, or even removable for faster and quieter movement of troops. 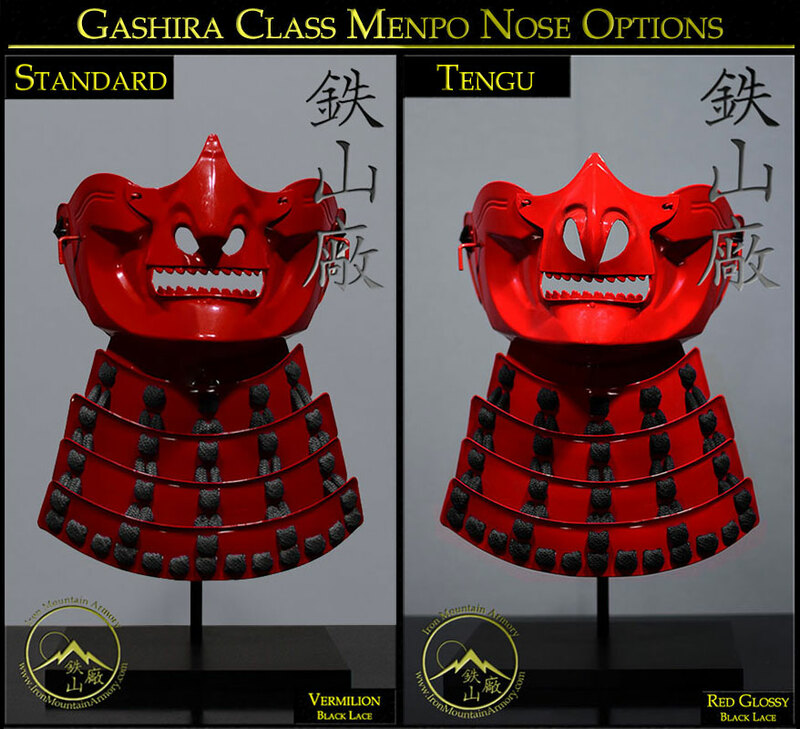 Dō MON OPTIONS – This gives you the option of painting a samurai clan, school or custom mon (symbol) on the chest of your armor. A custom mon needs to be emailed to us in a “clip art” format and mono-color. 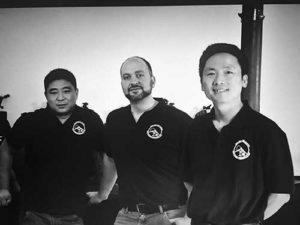 SODE STYLE: This option will change the different style of sode can order. 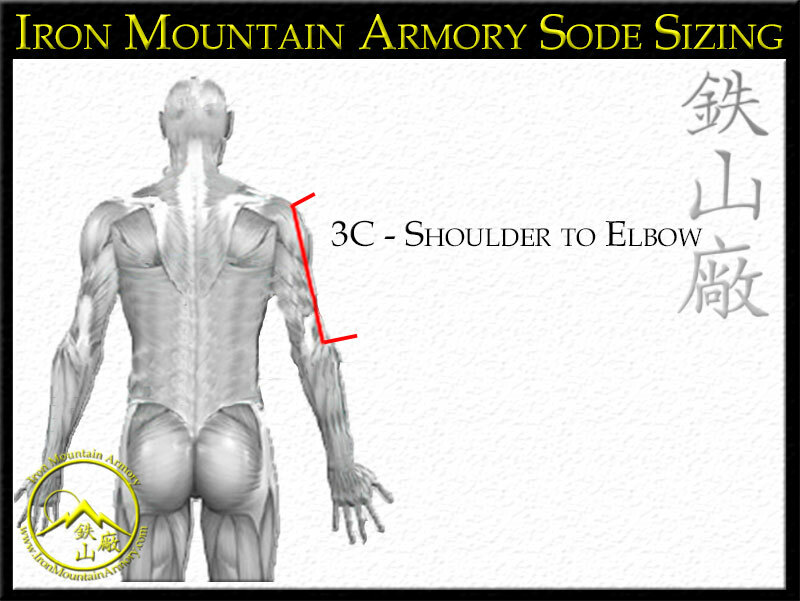 SODE SIZING: This option will effect the length of your sode. 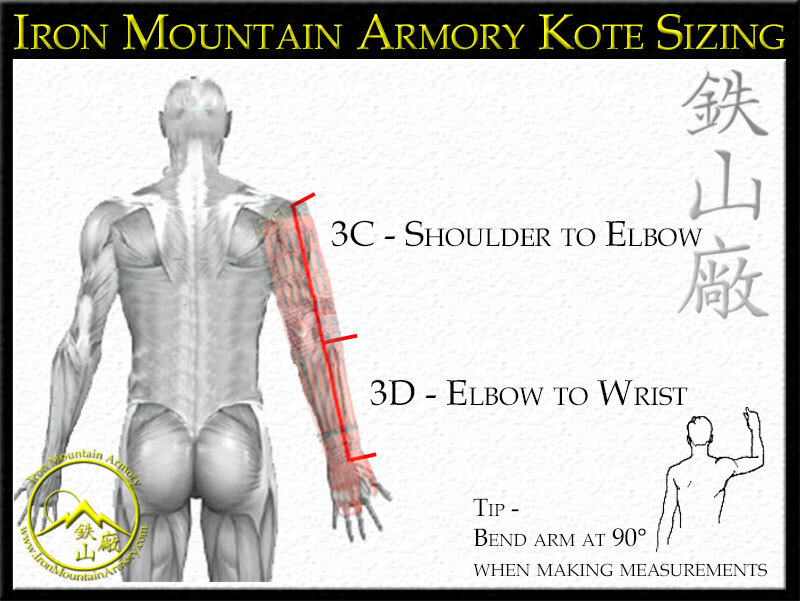 The measurement given should be from the outer corner of your shoulder to the top of your elbow. 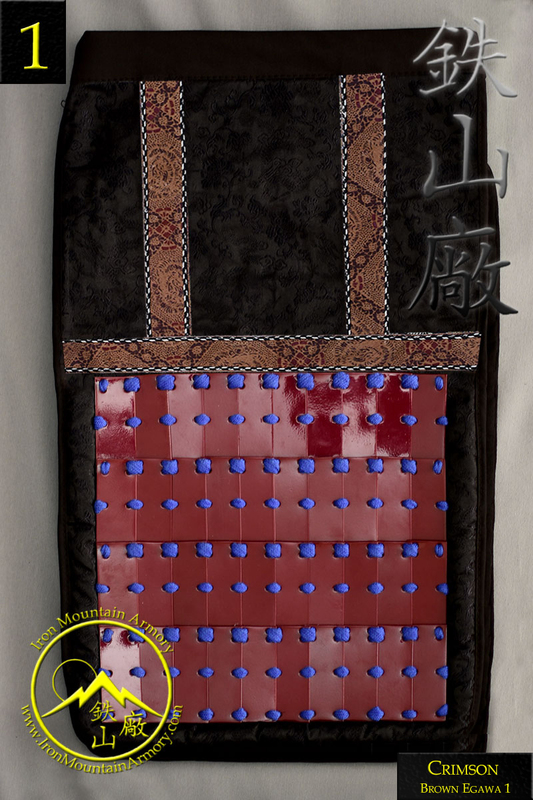 MAIN ARMOR COLOR: This option changes the color and texture which the chest and back of your dō will be painted. BOTTOM PLATE COLOR: This option changes the paint color and texture of the very bottom hanging plate. MAIN LACE COLOR: This option changes the color lace which is used on your dō. SIDE LACE COLOR: This option changes the color lace which will be used for the vertical laces, going down the sides of the sode. This is different from the mimi-ito. HANGING ROPE COLOR: This option changes the color of the rope that hangs from the sode ring. This connects to the back of the do to prevent the sode from falling forward during action. LEATHER OPTION: O-Sode option only, this option changes the color and design of the printed leather applied to the top of the sode. ROW LACE COLOR: These options change the color of lace used on each plate from top to bottom. MIMI-ITO LACE: This option changes or adds a color or multi-colored lace (depending on model and option selected) to the bottom and side laces of the sode. BRASS FITTINGS: The decorative brass fittings at the top of the shoulder armor. Kacho Sode do not have these. BRASS RINGS: The decorative brass bracket and ring halfway down the sode. These rings will be fitted with a tasselled hanging rope. These ropes are Red by default, but can be ordered in White or Yellow by special order. Kachi Sode lack both of these features. 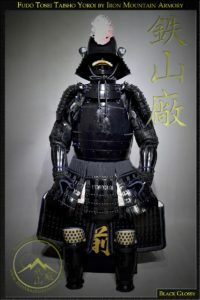 CLOTH BACKING: Each Sode is backed in cloth, which strengthens the shoulder plates, as well as helping to protect the other parts of the armor from scratching or snagging. 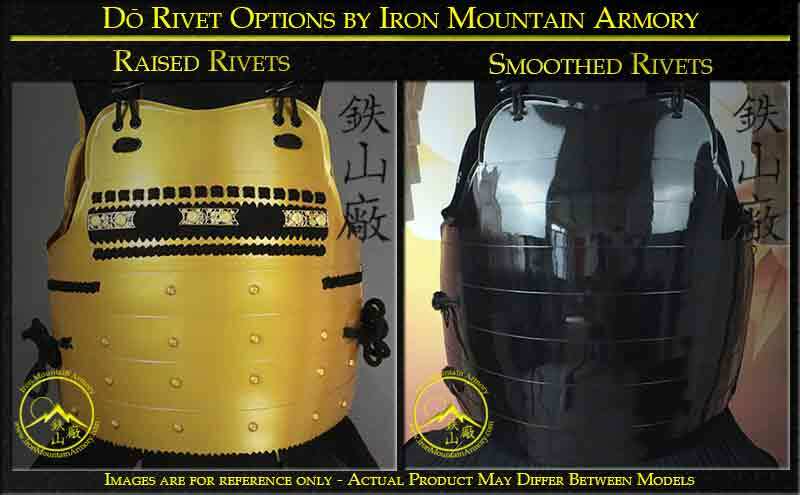 MAIN ARMOR COLOR: This option changes the paint color and texture of the armor plating. MATERIAL OPTION: This option changes the material used for the sleeve which makes up the kote. Hemp and brocades are standard options. MAIN LACE COLOR: This option changes the odoshi (lace) color used at the top of the sleeve. This part is used to tie the kote to the yoroi or around the body. Typically not seen. CUSTOM SIZING: This option affects the sizing of the kote to create a better fit for the wearer. 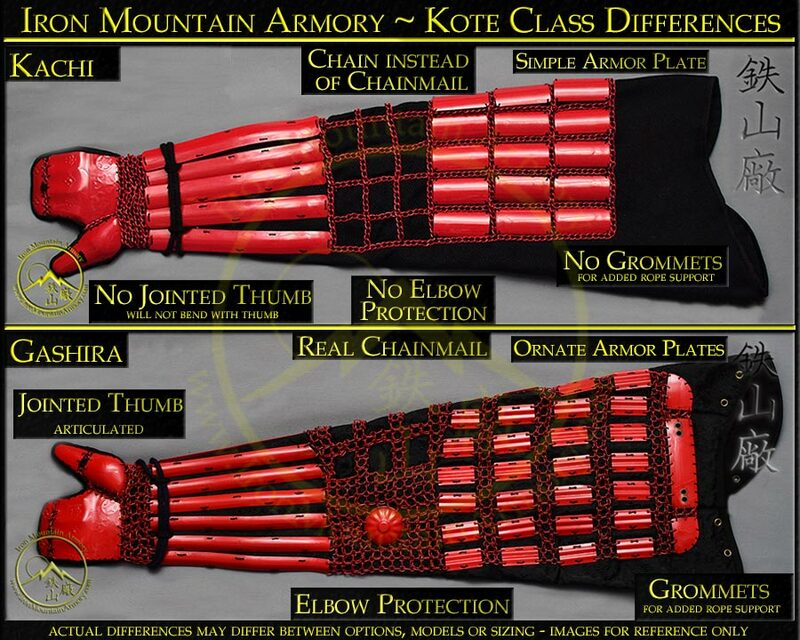 Please note the hand section of the kote is 1 standard size. Shoulder to Elbow: This measurement should be taken from the corner of the shoulder, where the sleeve meets the shoulder on a shirt, to the center of the elbow. Measure with your arm bent at a 90 degree angle. Elbow to Wrist: This measurement should be taken from the center of the elbow to the wrist bone. HAIDATE OPTION: This option tells us which style of haidate you would like us to craft for you. Option 1: The most simple and standard design features flat armor plates which are laced and layered like roof tiles. This has a medium level of flexibility. 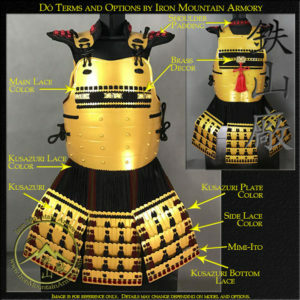 Option 2: The most simple and standard design features embossed armor plates which are laced and layered like roof tiles. This has a medium flexibility. Option 3: Pyramid armor plates features an embossed plating held together by kasari (butted mail). This has a maximum level of flexibility. 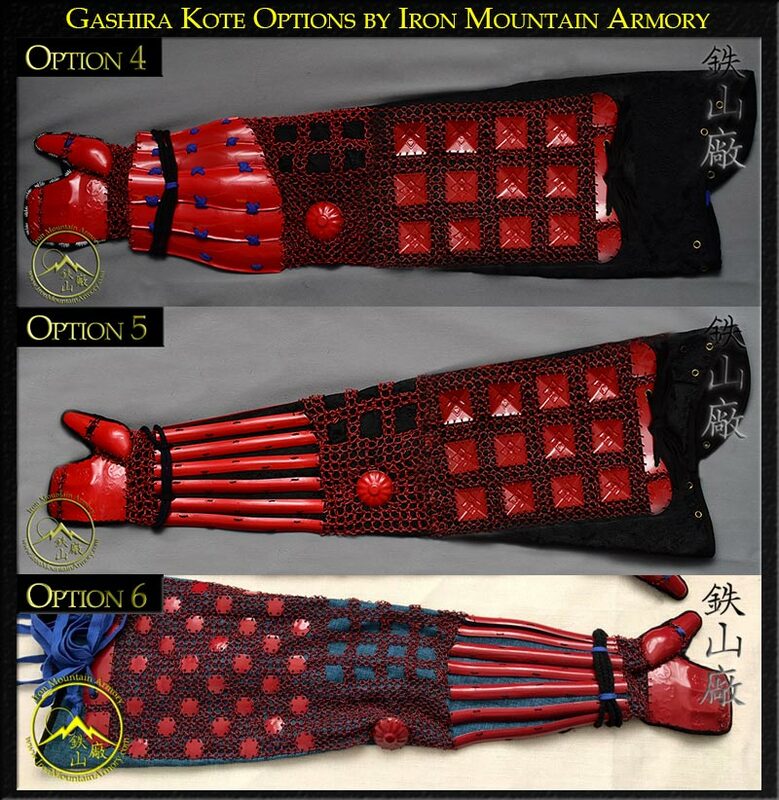 Option 4: Narrow armor plates (rafts), linked together by kasari (butted mail). This has a maximum level of flexibility. Option 5: Narrow armor plates (rafts) with disk plates at the bottom, and linked together by kasari (butted mail). This has a maximum level of flexibility. Option 6: Long, dome style plates, are linked together with kasari (butted mail). This has a maximum level of flexibility. MAIN ARMOR COLOR: This option lets us know the color and finish you would like us to use to paint the armor plating. 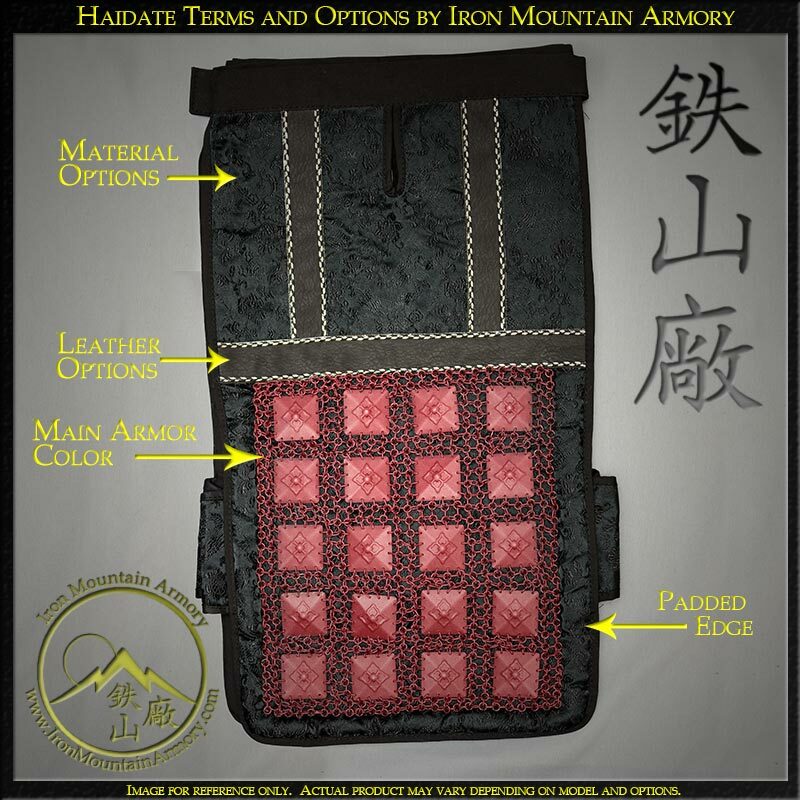 MATERIAL OPTION: This option changes the material or brocade pattern we will use to make your haidate. 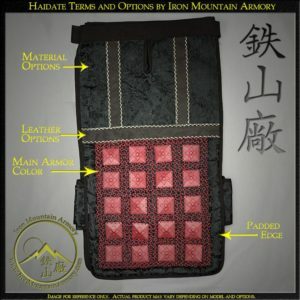 LEATHER OPTION: This changes the leather color and/or pattern that will be used on your haidate, above the armor plating. 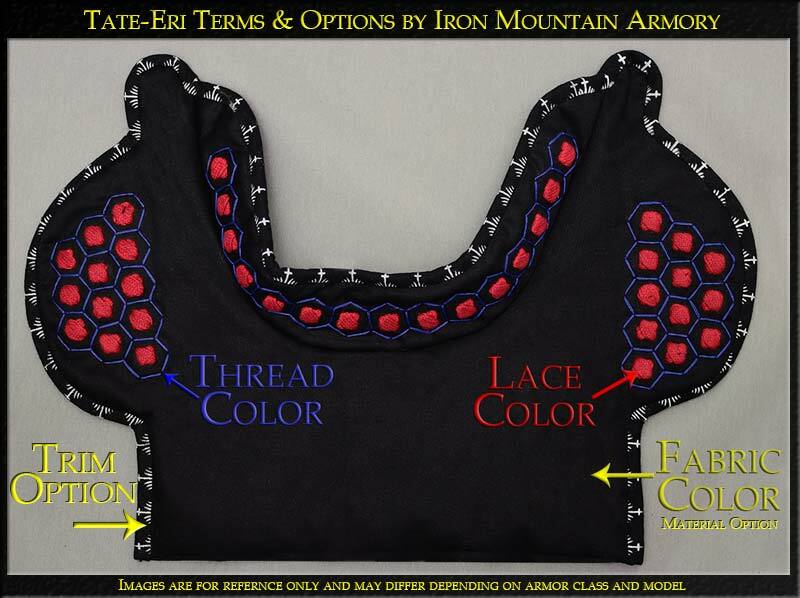 MAIN LACE COLOR: This option changes the lace used to hold the armor plates to your haidate. This depends on style you choose for us to craft for you. Padded Edge – Adds a padding around the outer and lower edges of the armor plate section. No Edge – Removes the padding and edging around the outer and lower edges of the armor plate section. The armor plates will come out to the edge. 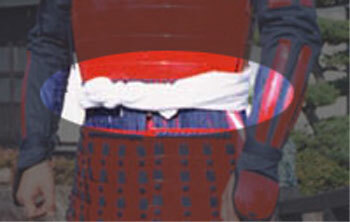 No Kosaru-Gawa – This removes the leather thong from the top center of the haidate. It can attach to the dō, to help keep the haidate from sagging. 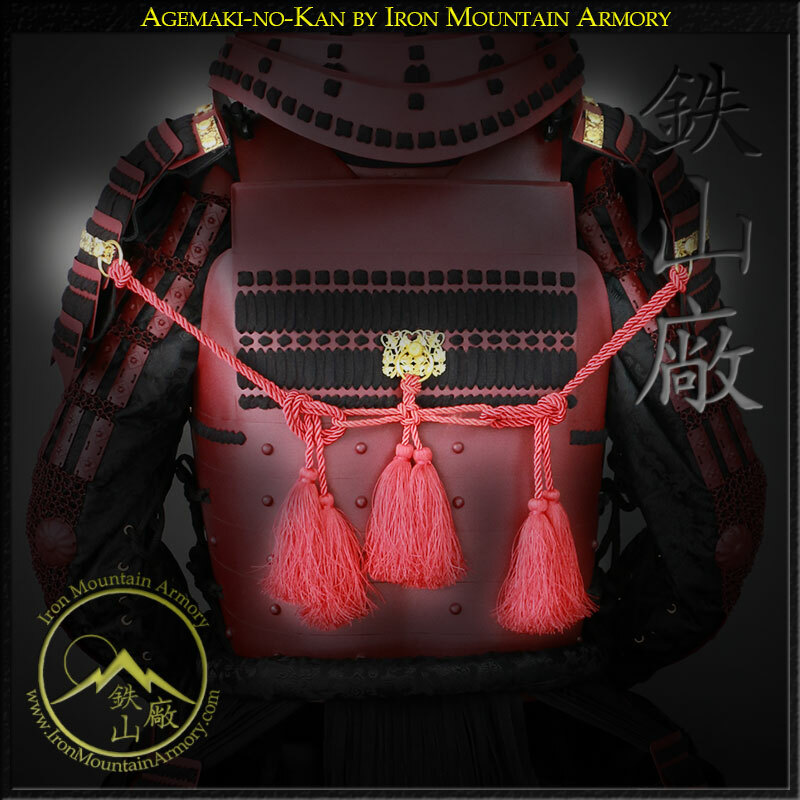 Add Kosaru-Gawa – This adds the leather thong and hikiagewana to the top center of the haidate. It can attach to the dō to help keep the haidate from sagging. 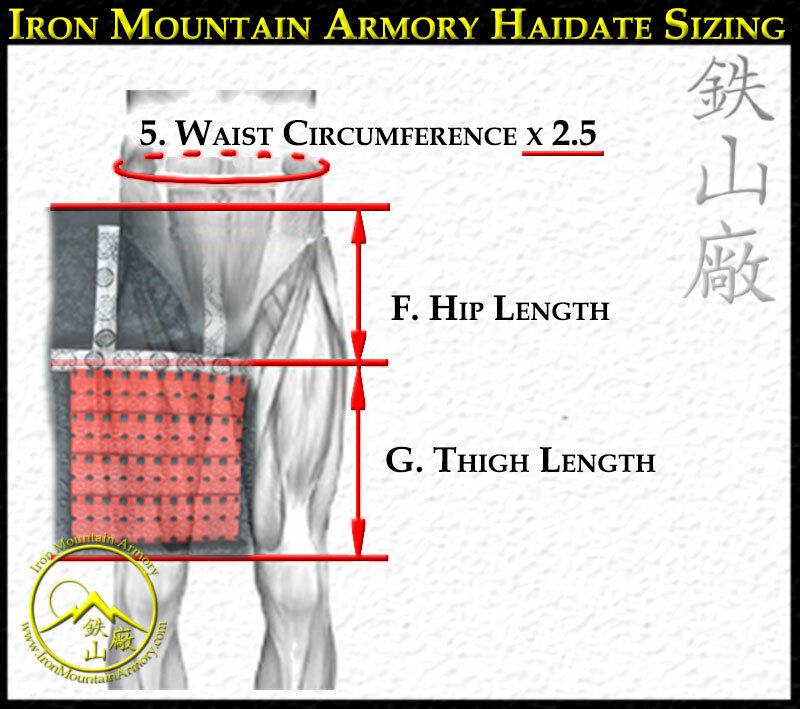 WAIST SIZE: This lets us know how to size the length of the himo (belt) which ties the haidate around your waist. HIP LENGTH: This adjusts the length of the haidate between the waist and top of your thigh to allow more comfort and flexibility when walking and seated. THIGH LENGTH:This adjusts the length of the haidate between the top of the thigh to top of knee, and to ensure more protection and comfort. SUNEATE STYLE: Use this option to select the style of suneate you would like us to craft for you. MAIN ARMOR COLOR: This changes the color and texture that we will use to paint the metal armor plates. MAIN LACE COLOR: Depending on the style you select, this option will change the lace used to tie the shin plates. ACCENT LACE COLOR: This is the lace color used to tie your suneate to your shin. MATERIAL OPTIONS: This option changes the material which your suneate is laced with. LEATHER OPTIONS: This option changes the leather that is used on the inside of the shin, above the ankle. HIZA LACE COLOR: This option changes the lace (knotting) used in the knee protection. HIZA THREAD COLOR: This option changes the thread used to outline the lace (knotting) in the knee protection. SUNEATE LENGTH: This option changes the length of the suneate. 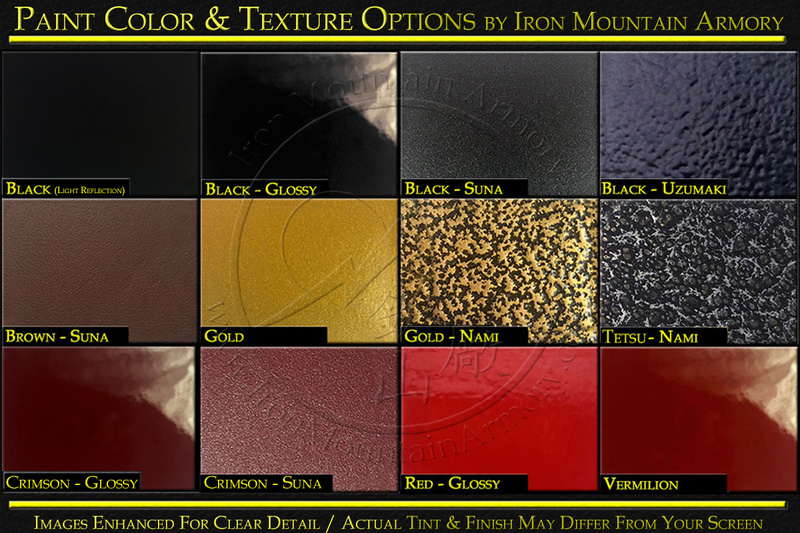 This section contains examples of the colors we can use to paint our suits and pieces of armor with. Please note that not all colors can be applied to all of our products, particularity on Kachi Armors. Check them out below! Our popular Black is a matte finish with a small reflective shine to it. It’s a good-all-around color which can provide a neutral base for more elaborate lace colors. Due to the painting process, the texture and level of shine may vary between separate orders. 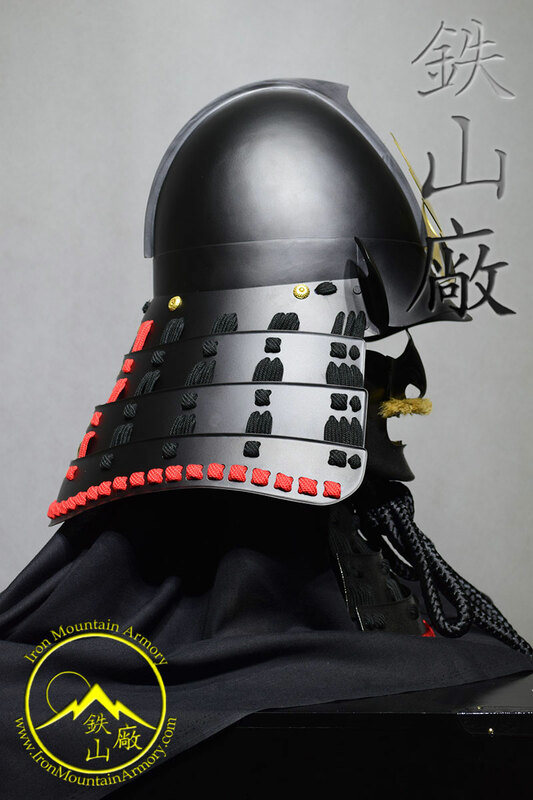 Our Black Gloss has a lustrous shine to it, resembling the traditional “Kuro urushi nuri“. Due to the painting process, the texture and level of shine may vary between separate orders. Our Black Suna is a paint that mimics a type of suna (rough sand) finish on the armor. This texture gives the feel of a light sand paper and absorbs light. This makes the armor look even blacker. The images may show a little bit of a “grey” tint on the armor. This is because of the lighting used to take the pictures, without the extra light, the images would be too dark to see clearly. As part of the painting process, the texture and level of darkness may vary between separate orders. Our Black “Uzumaki” paint has a slight shine with a light ripple effect in the paint. It mimicks a modest “tataki nuri” urishi, which was used on the more traditional yoroi. This is a unique paint finish which adds a subtle difference and a bit of character to the yoroi. As part of the painting process, the texture and level of shine may vary between separate orders. 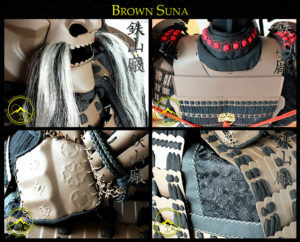 Our Brown Suna is a paint that mimics a type of suna (rough sand) finish on the armor. This color brown was chosen to resemble a “Sabi nuri” type finish, which is a lacquered surface – imitating rusty iron. This texture gives the surface a light sand paper feel and absorbs the light. This makes the armor look darker in lower light. As part of the painting process, the texture and level of shade may vary between separate orders. 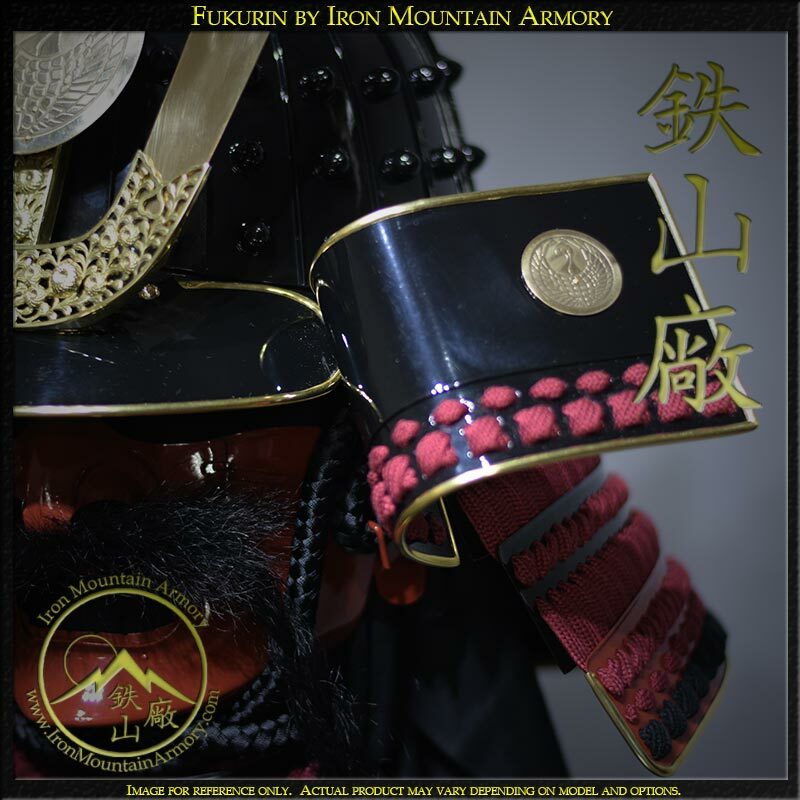 Our Crimson Gloss is a rich, deep red with a lustrous shine which resembles the “shu urushi nuri“, a traditional red lacquer finish used by the armor crafters of the Sengoku and Edo era. As part of the painting process, the texture and level of shine may vary between separate orders. Images are for reference only. Due to monitor color or resolution, color tones might be different. Our Crimson Suna is a paint that mimics a type of suna (rough sand) finish on the armor. This texture gives the surface a light sand paper feel and absorbs the light. It makes the armor look darker, as it reflects no light. As part of the painting process, the texture and level of darkness may vary between separate orders. Images are for reference only and due to monitor color or resolution, the color tones might be different. 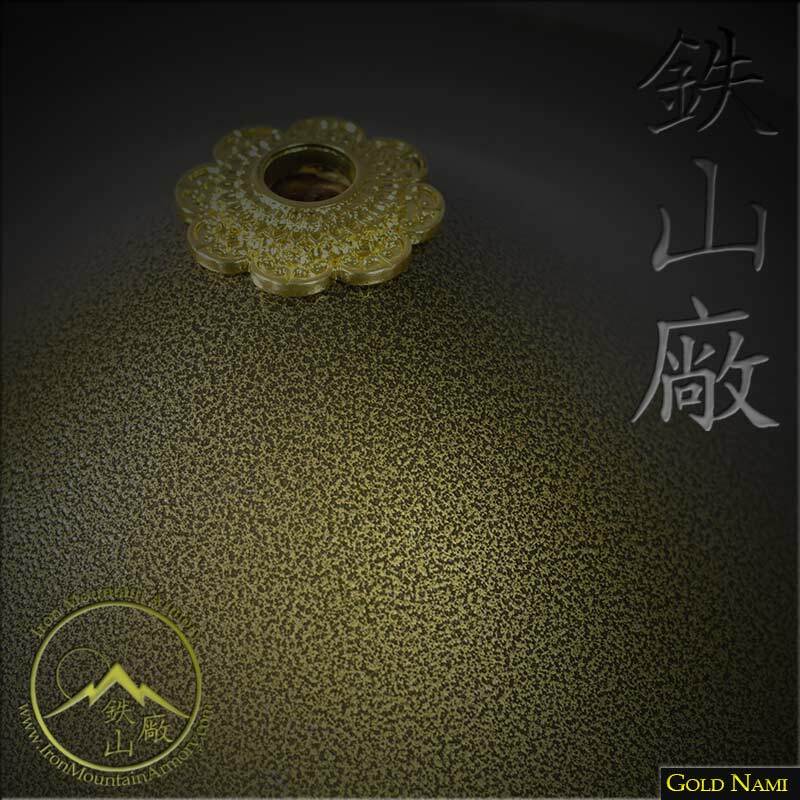 Our Gold Paint is the choice of wealthy Daimyo, and works great as either the only color, or as an accent color. The richness of this gold paint is quite alluring. Please know that gold paint does show more imperfections in the paint and the tint may change throughout the parts of a single order. This is a much more sensitive paint than the others. Images are for reference only and due to monitor color or resolution, the color tones might be slightly different. Our Gold Nami paint gives a regal and unique look to any yoroi. 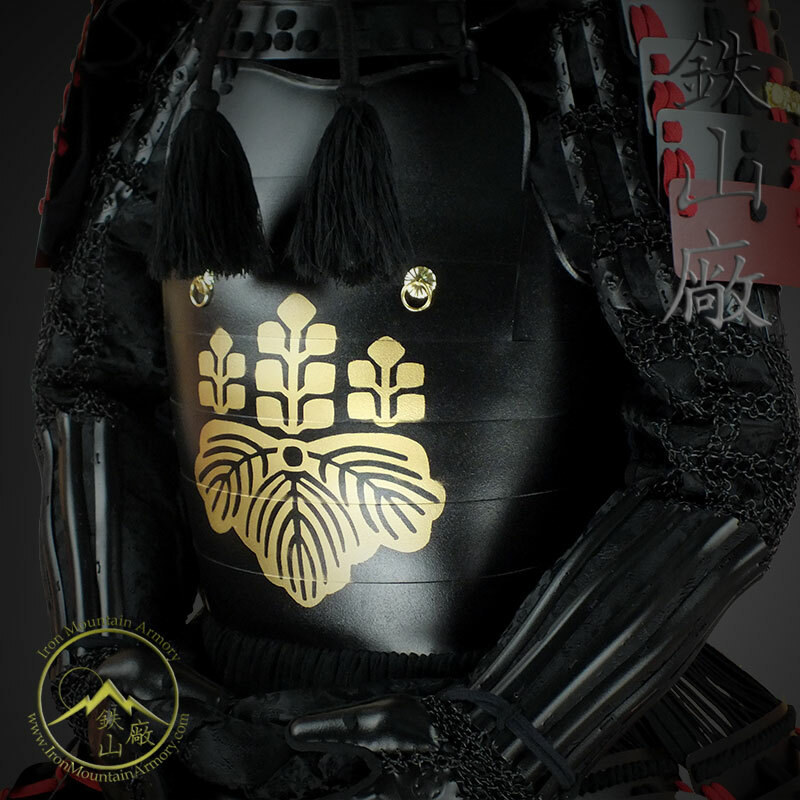 Usually reserved for higher quality suits, the rich gold texture is given a “nami” or wave effect which is a hallmark of the armor made by the Kaga school. As part of the painting process, the texture and level of tint may vary between separate orders. Images are for reference only and due to monitor color or resolution, the color tones might be different. Our Glossy Red is a bright and striking color, and will allow you to stand out on the battlefield above all others. 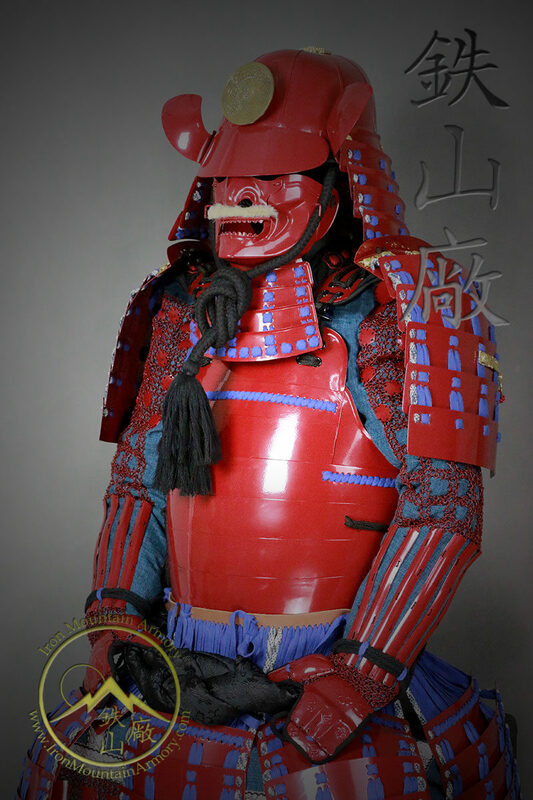 Bright Red was often used by those warriors who did not fear death, who welcomed all opportunities for combat. As part of the painting process, the tint may vary between separate orders. Images are for reference only and due to monitor color or resolution, the color tones might be different. Our Tetsu Nami has the color and texture of aged iron, known as “tetsu sabiji-nuri“, or a lacquer process that allows bare metal to be exposed to the elements without oxidizing. As part of the painting process, the texture and level of tint may vary between separate orders. 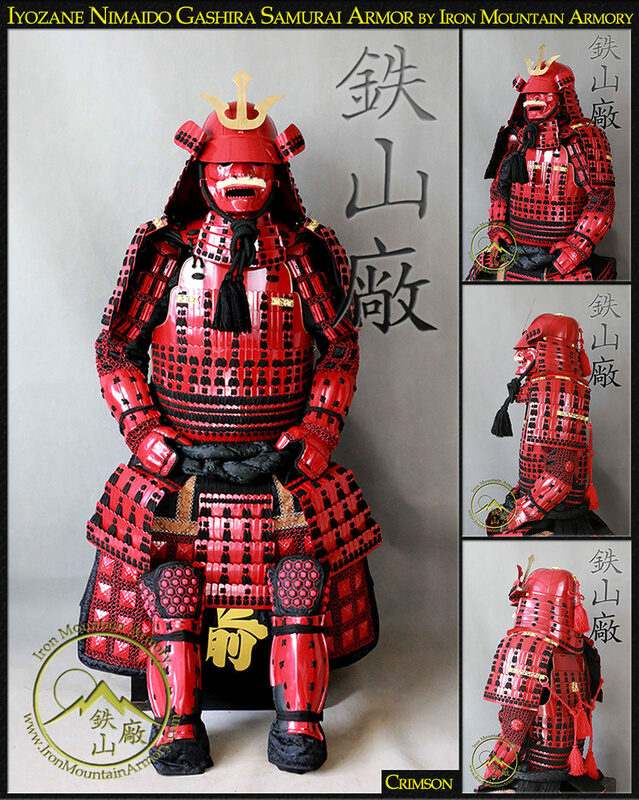 Our Vermilion is a rich, darker red with a lustrous shine giving your yoroi a very traditional Japanese look. The pigment was originally made from the powdered mineral cinnabar and was widely used throughout the history of Japan. As part of the painting process, the tint may vary between separate orders. Images are for reference only and due to monitor color or resolution, the color tones might be different. If so, feel free to contact us using the form below, and one of our friendly staff will respond to you as soon as possible. We look forward to hearing from you!